Maurice Ravel’s own Erard piano was the same model of the 1893 Erard in the Frederick Collection. However, to save an immediate audience move to the next room after the Debussy, we will be hearing instead the 1928 Erard, the “youngest” piano in the Collection. This piano was owned by singer and voice teacher Thérèse Leschetizky, daughter of important piano teacher Theodor Leschetizky. Thérèse reportedly acquired the piano from her father’s famous pupil, Ignaz Paderewski. The 1871 Streicher piano is from the same fourth-generation maker, and the same vintage, as Brahms’s own piano for the last twenty-five years of his life. The clarity of its bass tones serves Brahms’s music better than the thicker basses of most modern overstrung pianos. The single-escapement action, with its fewer moving parts, gives the performer a feeling of direct finger contact with the hammers on the strings. The Bösendorfer piano of around 1830 is one of the earliest pianos by that maker, during the time he was establishing himself as successor to the famous Viennese builder, Joseph Brodmann. The name on the front, printed on blue paper under glass, calls Bösendorfer “Brodmann’s pupil”. Slightly later Bösendorfer pianos, like the one in the collection at Yale, have a white paper label, saying “Formerly Brodmann”. Mark Alexander is a retired computer programmer who escaped to Vermont from Silicon Valley in 2009. He studied piano for three years as a child with Thomas LaRatta of San Mateo, California, then took a 20-year break from the piano. 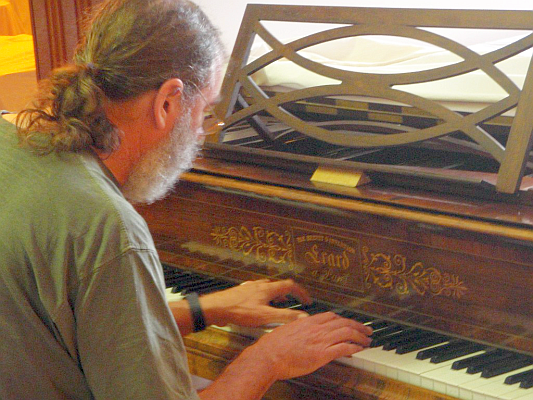 When he returned to the piano he studied with Lyn Bronson of Carmel, California, and with several teachers at Sonata Piano Camp in Bennington, Vermont.